One of the fun things about working with the Trade Literature Collection is that you never know what you might come across. There are hundreds of thousands of catalogs in the collection. The catalogs cover many, many subjects–food, clothing, toys, machine tools, boilers, lighting, medical supplies, and much more. But every so often, one catalog in particular might catch your eye. This time, it was a trade catalog by National Elgin Watch Co. It was the front cover that stood out. The inside pages show black and white images but the front cover has a striking illustration in full color. 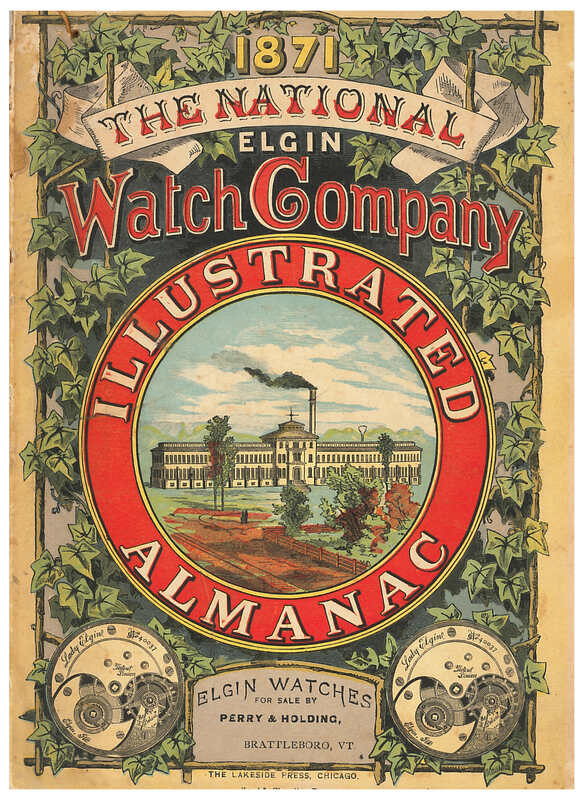 The title is National Elgin Watch Company Illustrated Almanac and it is from 1871. National Elgin Watch Co., Chicago, IL. National Elgin Watch Company Illustrated Almanac, 1871, front cover. National Elgin Watch Co., Chicago, IL. 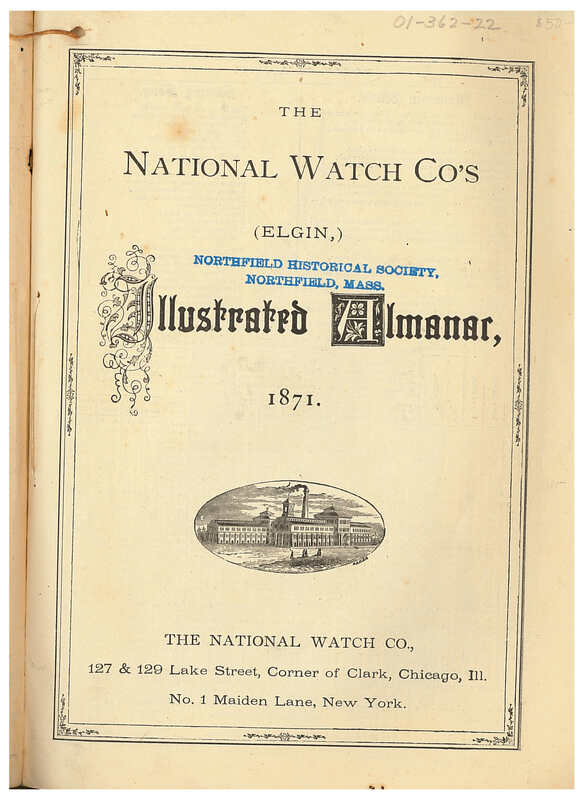 National Elgin Watch Company Illustrated Almanac, 1871, title page. Opening the almanac, you will quickly notice that each month of the year has its own page with a calendar. It lists sunrises, sunsets, and moonsets for each day of the year as well as the moon’s phases for various cities throughout the United States. There are also poems and illustrations related to that month. For example, the pages for January 1871 are shown below. The left page shows the calendar for January while the right page illustrates a famous clock called the Clock at Strasburg. National Elgin Watch Co., Chicago, IL. 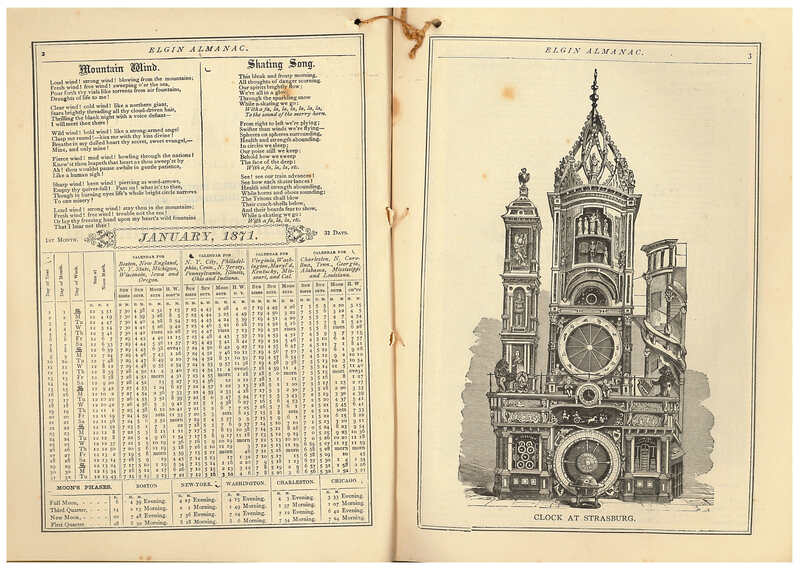 National Elgin Watch Company Illustrated Almanac, 1871, page 2 and 3, January 1871 calendar and Clock at Strasburg. The almanac has other bits of information too, such as detailed instructions on the “Care of the Watch.” Another page includes quotes from newspapers referencing Elgin watches. And there are also testimonials from satisfied customers. Near the end of the catalog are two pages illustrating the movements of Elgin watches. Those pages are shown below. National Elgin Watch Co., Chicago, IL. 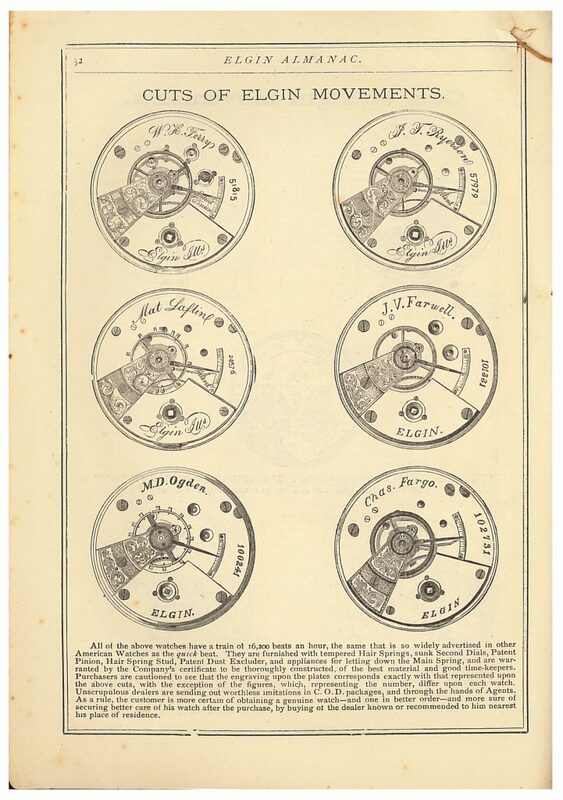 National Elgin Watch Company Illustrated Almanac, 1871, page 31, Cuts of Elgin Movements. National Elgin Watch Co., Chicago, IL. 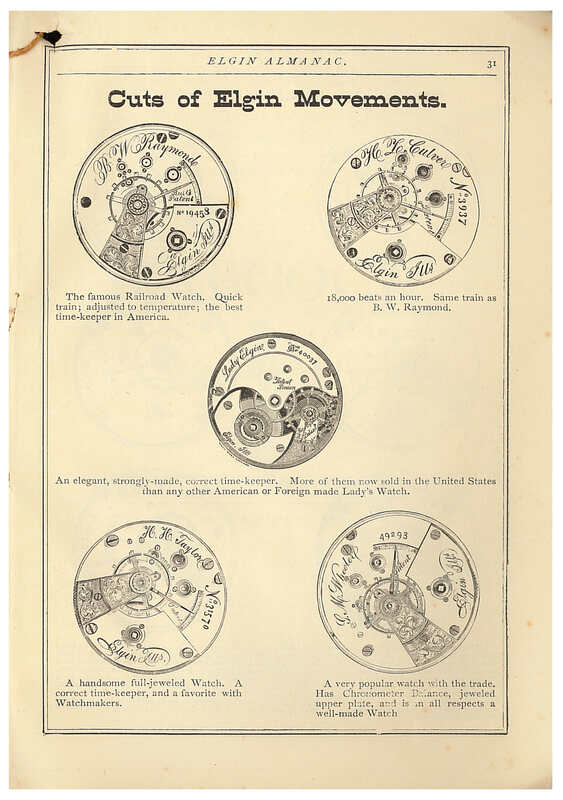 National Elgin Watch Company Illustrated Almanac, 1871, page 32, Cuts of Elgin Movements. National Elgin Watch Company Illustrated Almanac from 1871 and other catalogs by this company are located in the Trade Literature Collection at the National Museum of American History Library.